Hello folks. I’m not going to get all parochial on you here, but in teaching workshops and rubbing shoulders with other photographers I see lots of people struggling with setting up their tripods – some of them don’t even know that they are struggling. If it makes you feel any better, I once set up my tripod in such a way that it flopped over and snapped a $1400 lens in half. I’ve also witnessed a fellow photographer’s rig topple over, fall on to rocks below and in the process smash his lens to smithereens and create a hole in his camera body. Need more motivation? Six students had their tripods topple over when shooting at an event where there was gusty wind. None of them had done what we recommend below. 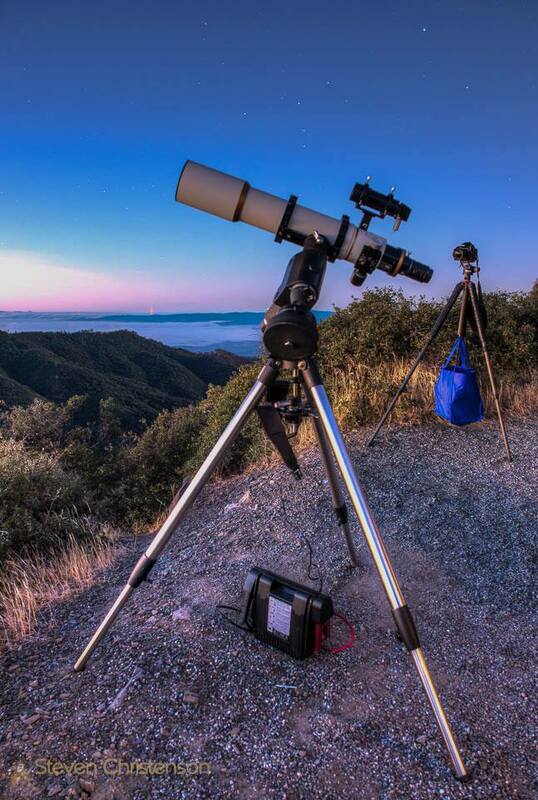 If you’re sure you know how to solidly set up your tripod and how to prevent an expensive catastrophe, well, you probably stopped reading when you saw the title of the article. Still here? There is no substitute for using a sturdy tripod as we described earlier. However an improperly set-up tripod will give you a false sense of security. Feet: The part of the tripod that touches the ground – the bottom of the legs. Leg Locks: which are of two general types: flip locks and screw locks (shown). We prefer the latter. Leg Pivots: The upper side of the legs attach to the BASE where the legs can be made to pivot inward or outward. Usually there are options for specific pivot angles. Tripod Base: The leg pivots are on the underside of the base. Center Column & Center Column lock: If the tripod has an extensible section separate from the legs, it usually fits through the base and has a lock to secure the center column height. Some center columns also have a hook at the bottom (as shown). Base Plate: The top surface of a center column (or the top surface of a base) to which the head is attached. Head: The purpose of the head is to allow the camera to rotate and tilt. There are two principle types of heads: ball heads (shown) and pan/tilt heads. Quick Release Clamp: the upper surface of the head usually has a clamp/plate system to make it easy to mount and unmount a camera. Arca-Swiss is the most popular clamp/plate system. Quick Release Plate: attach securely to the camera and is held by the QR clamp. Camera: the reason you have all the preceding stuff. Vertical: Your tripod should be vertical, specifically the center column (if you have one) should point straight up and down. The more vertical, the more stable the tripod is. By vertical, we don’t mean perpendicular to the ground – the ground may be sloping or irregular. 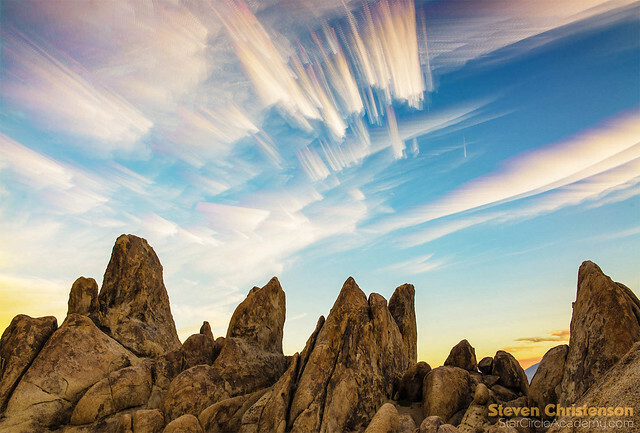 The most common mistake people make is to set their tripods up so that it leans toward them. Before you put your camera on your tripod, walk around the whole thing (safely) to judge the verticality. You can even use a level (e.g. a smart phone app) against the center column to be sure it is vertical. 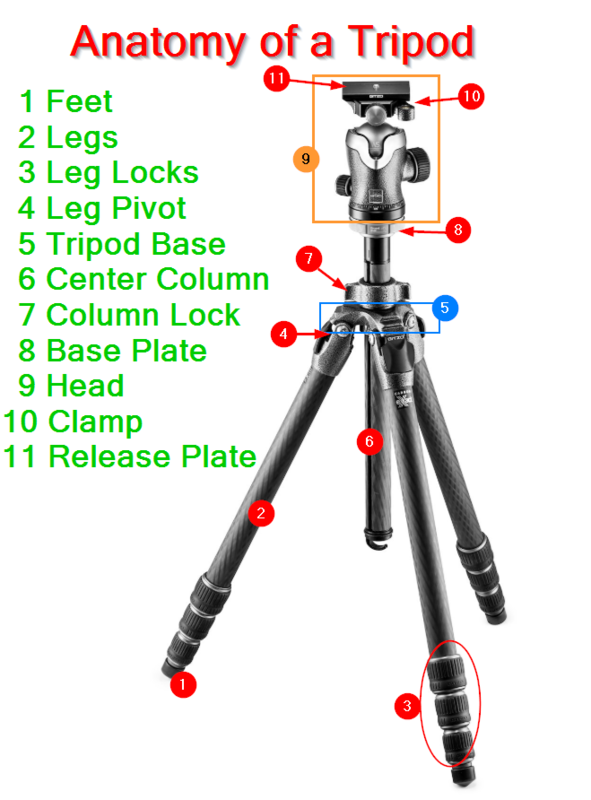 Some tripods have a bubble level on the base – and some heads have a level on their base – that you can use to be sure your tripod base is level. Notice tripod in the distance is leaning to the right (click for a bigger view)? That’s wrong! Level: For many reasons, you want the base to be level (perpendicular to vertical). If your tripod is vertical, the base will be level. A level base makes panning (and thus panoramas) more accurate. If the base isn’t level rotating the camera may change the center of gravity causing wobble – or worse. Legs: There are two adjustments here: the leg length and the leg spread. DO NOT fully extend the leg lengths – unless you are on flat, level ground. Adjust the legs so the base is level. When on a slope, put two legs on the downhill side of the slope and one leg on the uphill side. Place two legs at the front (that is where the camera is pointing) and one leg toward the rear. Extend the wider leg segments fully before extending the narrower leg segments. TIP 1: We find the screw-type leg locks to be the most secure and easiest to adjust. What we do is to grasp and loosen all the leg locks at once by a quarter turn. Fully extend all sections. Tighten the top locks fully (and middle locks – if you have 4 segment legs), then loosely tighten the smallest leg locks. When setting the tripod down you can gently push down each of the legs until it is vertical and level, then fully tighten the lower leg locks. Minor fine tuning can be achieved by loosening the upper leg locks. If in windy conditions, set the tripod lower than normal and spread the legs wider. Also weight the system more heavily (see Weight, below). Center Column (and tripod height): DO NOT extend the tripod fully just because you can. Extend the column as little as needed. The center column is useful for fine-tuning the height of the camera, but it raises the center of gravity and makes your tripod less stable. Likewise making your tripod as tall as possible makes it easier for gusty wind or and inadvertent bump to topple everything. Hang your camera bag so that it nearly touches the ground (by using a lower tripod position, or a strap between the bag and the tripod). Then place rocks or logs around the bag to keep the bag from swaying. Add heavy things in to the bag if you need more weight. Bring a tie-down stake and a bungee cord. Screw the stake into the ground below your camera and snug the tripod hook to the stake with a bungee cord. Straps: If you have shoulder or wrist straps on your camera we recommend using removable ones OR use twist ties or velcro wraps to secure the straps to your tripod so the straps do NOT catch the wind (or nearby objects). Shoulder straps can become like sails and even if they don’t catch enough wind to topple your tripod, they can induce vibration. We really like OP/Tech products, by the way. They are well designed and have never failed us. Tip 2: One way to practice setting up a tripod is to do it indoors. Create un-even scenarios by resting one (or more) of the legs on a chair, wastebasket, etc. Practice getting the legs adjusted in a way that keeps the center column vertical and the base level. Pull down on each of the legs gently. Make sure they don’t collapse/fold. After clamping the camera to the head and tensioning the head. Hold the camera snugly and try wriggling the camera out of the clamp. Watch carefully for wobble and hold on securely in case the camera does come out of the clamp. Hold the camera, release tension on the head and let the camera gently flop. Make sure that when the camera flops the system doesn’t topple. Leave the camera in its flopped state and rotate 360 degrees checking for wobble. Repoint the camera, tighten the tension and gently bump the camera. Make sure there is no wobble. Bump each of the legs. Make sure the legs don’t become dislodged and the spread doesn’t change. Take one more lap around your camera checking for verticality and possible instability – e.g. a log, tree branch, stick or rock that could bump your tripod. Is all of the above really necessary? Well, no. You don’t have to do any of that… unless you want to protect your equipment and take nice stable photos. Here is my son with the tripod legs set wide, and the center column inverted to get the camera low to the ground. Want tips on other gear to carry… see this article. Would you like to see all of our best tips in one place? Try this article. 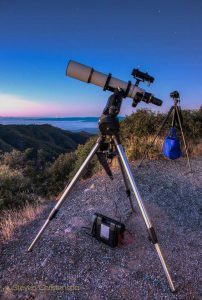 Have a great tip on tripods we should know? Please share it in a comment! This entry was posted in Gear, Tools, Tripod and tagged ball head, center column, leg locks, legs, level, pan/tilt, safety, secure, spread, tripod, vertical on June 2, 2018 by Steven Christenson.